The President's Run will take place on Saturday 12th September 2009. As last year, there will be a choice of rides leaving the cafe in Ponteland at 10am, with all rides converging on the Swinburn Arms in Stamfordham for a buffet shortly after noon. There will be rides for all abilities, so please make every effort to join us. All club members are welcome. The buffet is subsidised by the club, and the cost to members will be £2, £5 for partners/guests. If you wish to attend, then please let Simon Gibbs or Wilf Gillooly know with a firm commitment, as they need to know numbers for the buffet. 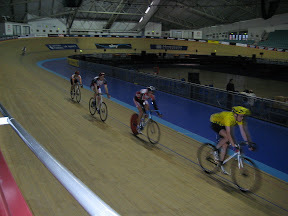 The club visit to Manchester Velodrome on 10th January was a great success, with 7 club members making the journey, together with Rob and Adam Hogarth and Nigel Heighton. The day consisted of a track session at lunchtime, organised by Newcastle Phoenix, then watching the Revolution race meeting in the evening. Written by Joe Applegarth - Houghton C.C. Houghton C.C. are promoting a 100km Audax on Sunday 30th March 2008. This is a new event on the Audax calendar and the first time Houghton C.C. have promoted a 100k event.